Everywhere we turn – there’s such a lot of stuff, isn’t there? Some of this stuff we love, but so much of it ends up in the bin at the end of the day, week, or month – forgotten about. And that’s just the stuff we buy ourselves! What about all those unwanted gifts at Christmas and birthdays? We’ve found that 87% of people receiving gifts at Christmas receive at least one unwanted gift, and 67% of parents expect their children to get bored of their presents shortly after the festive season. 28% of parents expect this to be on Christmas day itself. And what happens to these unwanted items? They might end up stuffed in the back of a cupboard, being donated, or being put out with the rubbish. The feeling that the world is getting rather ‘full’ is only one reason for the recent surge of interest in recycling, upcycling, and repurposing. Finding a new use for an old thing isn’t only satisfying, it’s also a way to look after the contents of your wallet too. It seems that most weeks there’s a blogger or eco-friendly innovator attempting to go a full year without throwing anything away, or eliminating all non-recyclable packaging from the products they buy. Minimising waste and shopping with thought isn’t just wise, it’s on-trend, too. One way innovative craftspeople are working to minimise waste in the world is to create something beautiful and new from something old. It’s traditional recycling, but with a quirky twist. Paper, metal, fabric, yarn, tyre, glass… All of it can be transformed from the potential contents of landfill to something you’d be proud to own – minimising waste, reducing carbon footprints, and creating beautiful objects with a history all their own. By choosing a recycled gift you’re doing the earth a favour and taking home something with a story. It’s new and contemporary, yet a treasure and a relic at the same time. These items aren’t throwaway – they’ve grow old with you. Traditional metalworkers at Noah’s Ark in India transform sheets of iron, old oil drums, keys, and bicycle chains into innovative handcrafted homewares; bowls, lanterns, wines racks, clocks, and quirky garden sculptures. Perhaps it’s the chains and keys that are most meaningful of all. Keys symbolise secrets and histories, while the bicycle chains bring to mind journeys around the world, traveling to exotic places, and experiencing the wonders of nature. They’re brilliantly steampunk, and the perfect recycled gift for a wanderer, explorer, or vintage enthusiast. Discarded rubber is cut, curled, and painted into garden pots and planters of all shapes and sizes. Who knew rubber would work so well! 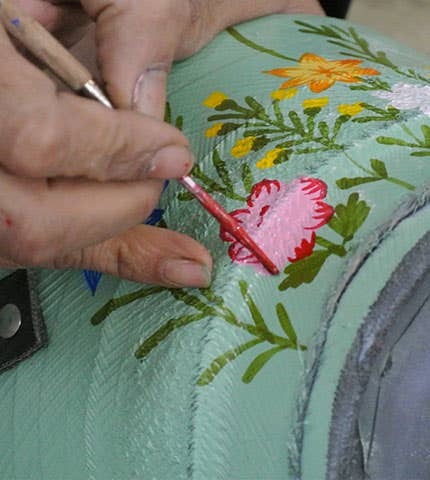 The artisans at Noah’s Ark expertly use the rubber from discards tyres to form the planter itself, and then paint the surrounds with bright water-resistant paint. Isn’t this just the perfect way to start an eco-garden? Look at these colours! The most brilliant thing about using scraps and remnants of sari material is that there are just so many shades and patterns that every item made is completely different. And just like in life, it’s nice to be surprised sometimes. Torn into strips, the sari fabric can also be spun into silky yarn and strong twine – ideal for adding a cultural (and completely original) twist to craft projects or gift wrap to add flair to your recycled gifts. Weave the yarn and you’ve also made some pretty incredible furniture, too. Paper’s the thing most people think about when they hear the word recycling. Did you know that each ton of recycled paper can save 17 trees from the chop, 380 gallons of oil, 4000 kilowatts of energy, and 7000 gallons of water? And as well as all that – recycled paper is beautiful! 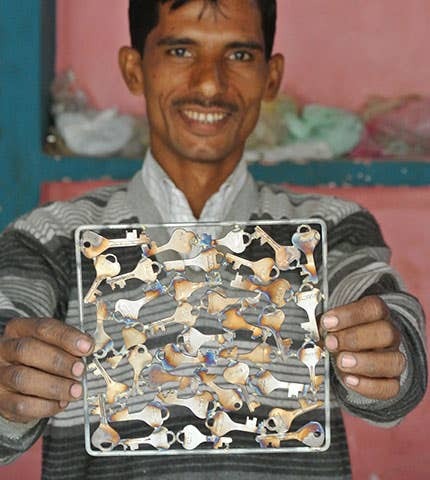 Our artisans use waste paper to craft handmade cards, gift wrap, Christmas decorations, and even little pieces of paper furniture! Glass is amazing in that it can be recycled endlessly without any loss of clarity or purity. Our recycled glassware comes from fair trade co-operatives in Bolivia and Swaziland, where earth-conscious crafting and minimising energy consumption is at the forefront of their minds. Once the discarded glass (such as thrown-away soda bottles) is collected from the local area, it’s sorted into colours and crushed, before being melted down and handcrafted into a new shape. Glass doesn’t degrade, so technically can live forever. Incredible! Eco-friendly gifts are the way to go, whether you’re an eco-warrior, thoughtful gifter, or ethical shopper. All of these handmade gifts are radiating with creativity, history, and curiosity. 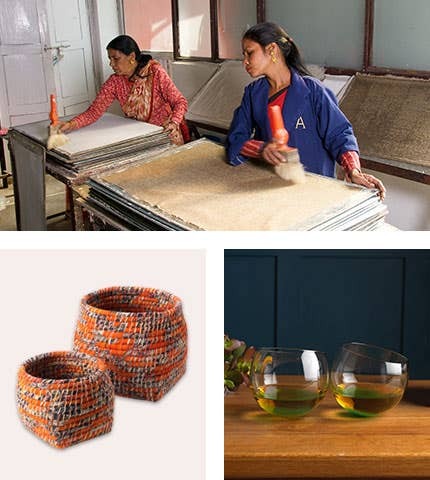 Explore Traidcraft’s range of recycled Christmas gifts to discover a whole world of eco-gifting.